Maccaferri is the global leader in the manufacture, design, and supply of gabion baskets. Maccaferri gabions are cages which are engineered from double twisted hexagonal woven steel wire mesh. 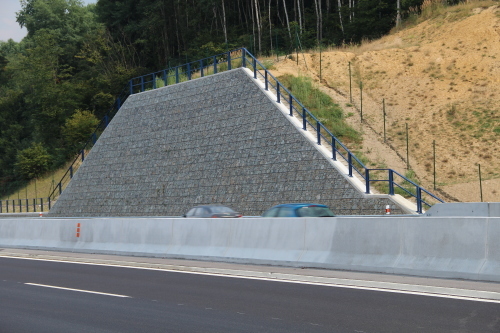 The combination of soil nailing and gabion retaining walls walls proved to be an ideal solution in the stabilization scheme of the D1 Suban Skala—Turnay road cut project—finished in June of last year (2015). To ensure the stability of the road cut in difficult geological and morphological conditions, soil nailing with shotcrete and gabion cladding in inclination 3:1 was proposed. The nailing surface of the wall is protected with shotcrete with a thickness of 200 mm. The total length of the wall is 100 m. The maximum height of the nailed wall is about 9 m.
The cladding of gabion baskets are made from welded steel mesh size 5×10 cm and 10×10 cm with a wire diameter 4.0 mm protected against corrosion by GalMac galvanizing. The 0.3 m and 0.5 high baskets are filled with selected stones. Individual baskets are connected to each other with C-rings. The baskets themselves are anchored to the shotcrete by anchors with threaded rod φ16 mm with nut and anchor plates at 1×1 m. All anchorage elements have an anticorrosive treatment.